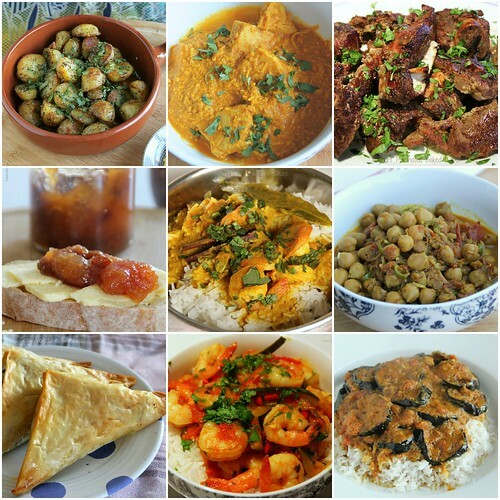 We've had a wonderful six months at I Heart Cooking Clubs, cooking delicious Indian food with Madhur Jaffrey. For me, this has been something of a trip down memory lane, remembering the food and flavours of my childhood. The food of course has been wonderful, but one of the things I've found most exciting about our time with Madhur has been the way some members of our group, who had never even tasted Indian food before, have embraced this cuisine and loved it. ... and if I had to choose a favourite, it would probably be the Prawns in a Dark Sauce, only because that was the most nostalgic dish for me. I've made it several times again since, and the Yoghurt Marinated Baked Lamb and the Black Pepper Potatoes with Lemon Turmeric Aioli are also dishes that I keep coming back to. Interestingly, the black pepper potatoes has been the most visited one of my Madhur posts too (almost double its nearest rival), so I guess a lot of you like that one too. And, now comes the time to say our farewells to Madhur - an occasion tinged with a little sadness (as accompanies any "goodbye"), but also with excitement about our forthcoming chef, Yotam Ottolenghi. For my final dish with Madhur, I chose Cauliflower with Potatoes (Phool gobi aur aloo ki bhaji) from Madhur Jaffrey's Indian Cookery, partly because this is the kind of simple, homely kind of dish that I think epitomises Indian home cooking for me, and partly because I had a head of cauliflower in the veggie crisper that need to be used up. This dish doesn't have any sauce, and is fabulous just scooped up with some flatbread (I could happily make a meal of this on its own). As it turned out I had this as an accompaniment to roast pork, and I think it would be a great addition to any other meal of roasted or grilled meats. Boil potatoes in their jackets until just fork tender. Drain and allow to cool completely. Peel off the skins and cut into 2cm (3/4 inch) dice. Set aside. Heat oil in a large, non-stick frying pan over medium heat. 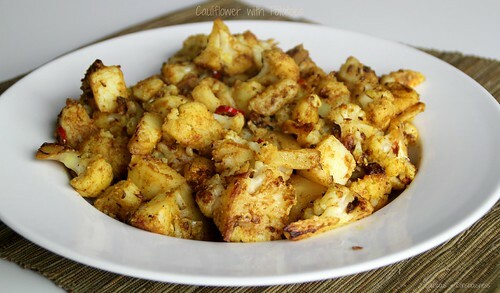 Add cumin seeds to the hot oil and, as soon as the seeds start to sizzle, add the cauliflower florets to the pan. Toss the cauliflower in the pan until all the florets are coated in the oil and seeds. Now, reduce the heat, cover the pan, and cook gently until the cauliflower is browned in places and just tender - stir from time to time. About 6-10 minutes. 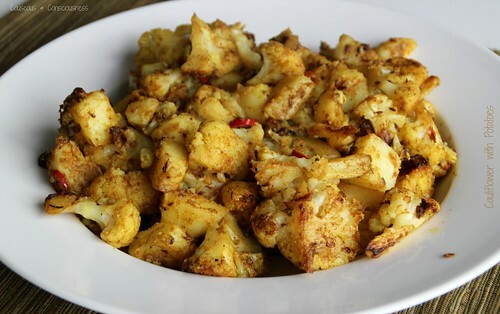 Once the cauliflower is tender, add the ground spices, chilli, potatoes, salt and pepper. Stir gently to coat all of the cauliflower and potato with the spices, and continue to cook on low heat for a few more minutes until the potatoes have warmed through. Serve hot, but is also good at room temperature. ... or check out Madhur Jaffrey's Indian Cooking and many of Madhur's other great titles available from Amazon USA, Amazon UK or Fishpond NZ. I'm also sharing this post at See Ya In the Gumbo hosted by the lovely Michelle at Ms. enPlace. Thanks, Deb - hope you give it a try - I'm sure you'd enjoy it. I loved all the dishes I made with Madhur. I love cauliflower and have never tried the combination with potatoes before, even better, potato is another favourite of mine! 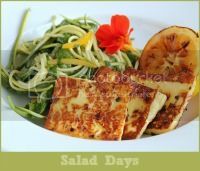 Looks delicious and flavourful with all the wonderful spices! Thanks, Joyce. I love the combination of cauliflower and potatoes together. This has been one of my favourite Indian dishes for many years - it was nice to make Madhur's version. This may be one of the first Indian dishes I ever ate. Funny enough, I never made it while cooking with MJ. That's just the kind of crazy thing I do. When it was announced that Yotam Ottolenghi would be the next IHCC chef I thought, "wait, who?" After looking through some of his recipes, I realized I've tried one of his recipes before. And guess where it came from? YOU!! I don't even remember when, but you once posted about lemon risotto with eggplant and it looked so beautiful I had to try it. Michelle, I'm so thrilled that you made the lemon and aubergine risotto. Hope you liked it. It's one of my favourite Ottolenghi dishes - I'm sure you're going to enjoy this next six months. Thanks for linking up, Sue. And, yes, we did like it. very much! Sue, your dish had the most visits last week and will be featured at this week's potluck. Thanks again for joining in! Sue - I love the collage of MJ dishes. I need to learn how to create a collage. I made a similar cauliflower dish a few weeks back and it was absolutely delicious. I think this version with the potatoes added would be even better. I just noticed your sidebar full of links to all the Ottolenghi dishes you've made. Off to check them out. Thanks, Kim. The collage is really easy to make. I'll email you through the instructions and links. There have been some great Ottolenghi dishes there (and I've barely scratched the surface) - I know you would love the Turkey & Sweetcorn Meatballs. Thanks for stopping by and taking the time to leave a comment. I love hearing from you and your comments are like gold to me. Your comment will be visible as soon as it has been approved. My name is Sue. I am a passionate food lover and enthusiastic cook. I also teach yoga and maintain a daily yoga practice ... a practice which has led to a growing awareness of the need to live and eat more mindfully and consciously. I am by no means a strict vegetarian, but I do consume a "mainly vegetarian" diet and I make an effort to exercise ethically responsible food choices as much as possible. I therefore whenever possible seek out products which are free range, organic, seasonal and locally produced. I try to make most things from scratch, and to keep meals as uncomplicated as possible. Because I often teach classes in the evenings, it's important to me to be able to prepare a delicious meal quickly, from a few simple, good quality ingredients.